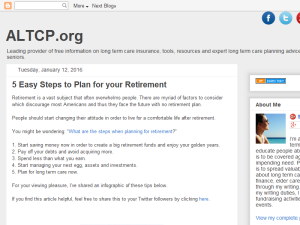 Blog Description: ALTCP is the leading provider of free information on long-term care insurance, retirement and other issues surrounding adult and seniors. It aims to increase awareness and educate people about the need to plan for long term care. With this information, people can prepare for the financial or emotional burden that long term care may bring to them and their loved ones.